"You have been most helpful and it is such a nice change to find that parts are available instead of being told to go and buy a new one! Well done to both you and Austral." - Tony, Sunshine Coast. "Your bricklayer (Justin) installed our new letterboxes last week and did an excellent job. He had to use mostly new bricks in the work but the effort he made to match the existing one was great. Please pass on our appreciation for a job well done!" - Paul, Labrador. "I have to compliment Craig on the job he did, it's an absolute work of art." - Doug & Susie, Bonogin. "This is just a little note but it carries a big "thank you" from me to you, your company and the installer. It is seldom today that professionalism, competency and courtesy come as a package but Sunni seems to have triumphed. Congratulations. It was a pleasure conducting business with you and I am so pleased with my clothesline." Dellis, Isle of Capri. 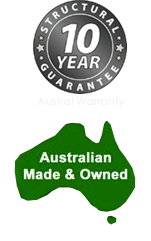 "14 years ago we installed an Austral Ezyhide retractable clothes line which has given us remarkable service over the years." - Ray, Ferny Grove. "Your installation man came and installed the Retractaway. He came early, installed it quickly and I made it to work on time. I wish to thank you and the installation man for doing a great job!" - Malcolm, Surfers Paradise.